You carry that in your back pocket? great way to give yourself and epidural whilst riding. 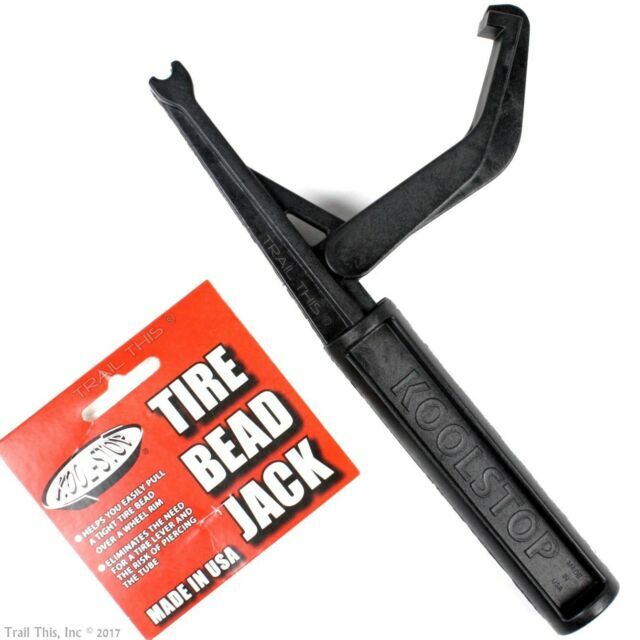 I've only used it a couple times so I'm not sure this rises to the level of the thread title but I like this little gizmo, the Kool Stop Tire Bead Jack, for mounting the tightest tires. Needs a wider/deeper throat for mounting modern 2-3" tires, but I agree. It is an invaluable tool. Hmm, I've been looking for something like this. Tubeless tires and older rim brake wheels are near impossible to mount/unmount. I eventually had to pair the sets with the least resistance combos. I've used the full-size truck tire pliers, but didn't even know they were made for bicycles? so does standing on the tire while the rim lays flat . . .
not going to work, try to remove a Schwalbe or WTBs from a 26" Sun Rhynolite. I've broken a few Pedros with those combo. Actually discovered the Vittorias and Geax are a tad larger and not a pain to work with. Folding beads and rim brake wheels don't like each other. not impossible, but any old wide rim brake wheel is a challenge. Mostly because there is no channel to slide the beads into to get some slack on the other side. Doing at home isn't a big deal, but getting flat and having the change it at the trail is not fun. Any old wheel is a challenge because of the lack of an 1/16" - 1/8" deep channel in side the rim? i cover the tip of the needle with a cork, and store the needle within the syringe tube for extra safety! If serious, you must have been adversely affected by a failed tubeless tire at somepoint. serious! i've been riding the RR tracks and superfund / greenways around here in Edison and South Plainfield. there's so much CRAP everywhere, i've gotten 4 large punctures in my relatively new Surly Ednas (have had them on since october 2018, approx 700 miles so far). every time i get a large puncture (three have been big nails / screws, one was huge thorn), there was a ton of sealant lost before i was able to get the plug in. so, i've started to travel with a 2 oz stans bottle to top off sealant mid-ride. however, taking out the valve core means the tire loses ALL of its air. this method can salvage some of that air and lessens the risk of having the bead come of the rim. i've only used this thing once, in my garage, and to be honest, this past weekend, when riding with some friends, we had a chance to use it on my buddies bike, but we opted for valve core removal instead, so it's definitely a work in progress, but i think there's something there! anyways, that's it! serious!, but seriously ridiculous, and did it just sort of to see if it works!